recreational setting. The vaulted, skylit entrance is set along the walk between the residential buildings and the academic campus, inviting access throughout the day and night. 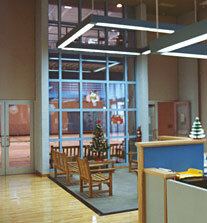 The central social space serves as a meeting place and for watching squash, racquetball, basketball and jogging. One can also access the ‘wet’ side for swimming, whirlpool, steam bath or sauna. There are organized leagues in many sports as well as individual athletic and recreational opportunities. All activities within this steel frame, brick clad building are totally accessible to the physically handicapped.